“You sound like me. You cook like me. You look like me. 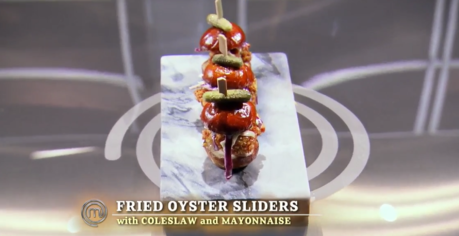 What’s your surname, Ben Ramsey?” said Gordon Ramsey as he dubbed oyster sliders from Ben Brown '21 “absolutely phenomenal” and “restaurant quality” during this week’s Season 7, Episode 5 of MasterChef Junior on Fox. If you‘ve been eagerly following MasterChef Junior, like so many of us at Peck, you saw Ben Brown hang on for another episode in a competition full of exceptionally talented young cooks. After Ramsey’s master class, the MasterChef Junior contestants who were at risk of elimination had 45 minutes to make their own signature slider. Ben impressed the judges with an oyster slider that Ramsey felt was of a caliber suited to MasterChef, the networks flagship celebrity cooking show with adults. Ben was happy to share his recipe again this week.